This week marks Australian Food Safety Week, a chance for the Food Safety Information Council and other industry/government bodies to help spread the message about food safety and protect public health. Common food poisoning symptoms include nausea, abdominal cramps, vomiting, headaches and diarrhea. But for vulnerable populations, such as children, the elderly, and pregnant women, the effects can be much more extreme – if not fatal. In support of Food Safety Week, Safe Food will be publishing an Infographic every day this week, to help educate consumers on some of the most common pathogens that can cause food poisoning, and how to reduce their risk. Today, we’re kicking things off with Listeria. According to a national Omnipoll research study released by the Food Safety Information Council, 1 in 3 Australians are either at risk of a Listeria infection themselves, or live in a household with someone at risk. Listeria Monocytogenes is type of bacterium that is naturally occurring in the environment and thrives in low temperatures, including refrigerated and frozen conditions. It has been known to cause a serious but rare infection known as Listeriosis, which generally causes influenza-like symptoms, fever, nausea, vomiting and/or diarrheoa. Listeria can be found in many foods, especially ready-to-eat foods that have not been stored or handled correctly after being produced or cooked, as well as on raw fruits and vegetables. 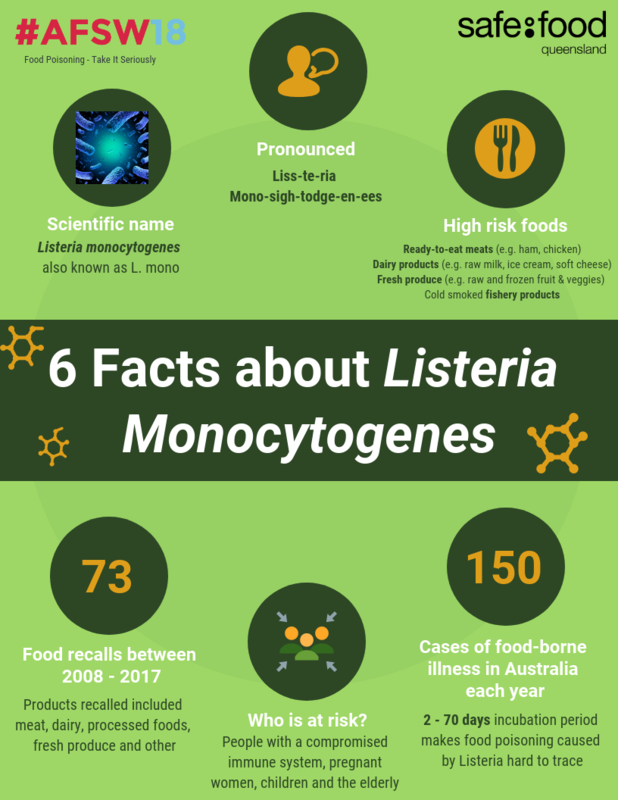 Unlike most micro-organisms, listeria can multiply in some foods, such as soft cheeses, smoked salmon and sandwich meats, even when stored under refrigeration for a long time. One of the most notable Listeria outbreaks this year involved rock melons, which affected 22 people in Australia and overseas, including 7 deaths and 1 miscarriage. refrigerate leftovers promptly and use within 24 hours, or freeze.